Expense control remained rigorous, but trading profit experienced a further decline. Labour unrest, port strikes and short-time working in the industry aggravated an already difficult situation. The business has been severely affected by falling demand for its core products – industrial sewing and embroidery machines. Demand is expected to remain subdued. Our UK-based sewing machine supplier continues to aggressively manage the cost base. A restructure is planned early in the new period. Vulcan maximised its trading opportunities as the hospitality industry expanded and upgraded catering facilities ahead of the World Cup. The year began hesitantly, but performance steadily improved. Both revenue and trading profit exceeded expectation. Cash flow improved despite an increase in working capital. Margins were well managed. Sales were strong to both the institutional eating and leisure segments of the market. 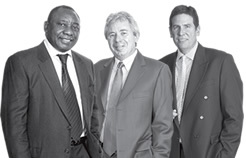 The export business achieved pleasing growth, as did operations in KwaZulu-Natal. Revenue was flat, but trading profit was significantly below budget in a disappointing year. The back-to-school peak provided a temporary respite and strong cash generation was achieved in the fourth quarter, though extended school holidays disrupted the usual trading pattern. Volumes overall were depressed as both cash-strapped consumers and companies reduced their office furniture spend. Changes in the sales mix away from higher margin items reflected continued pressure on consumers. Management has undertaken urgent action to extract costs from the business, but benefits will not be felt until next year. A purpose-built KwaZulu-Natal regional distribution facility is planned that will replace the current distribution centre and three retail outlets. Land has been acquired, but project completion and resultant efficiencies are not expected until 2012. A stronger rand, especially in the first half, was negative for the business and made it difficult for Kolok to maintain the strong financial momentum of the previous period. In unit terms, volumes were up throughout the year. The business was impacted by dislocation caused by the World Cup. However, improvements were achieved in working capital management and cash generation. Revenue was well down as demand continued to fall in both the corporate and project markets, resulting in an operating loss. Margins came under mounting pressure in a declining market. The business was restructured in line with the new trading environment and improvements achieved in debtors management. Three branches were closed and overhead costs reduced following job cuts. Retrenchment costs totalled R2,9 million. The business continued to innovate and give an industry lead in key areas, despite the recession. We import a board that complies with strict environmental standards. The German board manufacturer ensures that two trees are planted for every tree that is cut down to meet its production requirements. Results were extremely disappointing, though expenses were well managed. Volumes were almost entirely restricted to replacement of office furniture items as the corporate project market went into limbo. Delays caused by the transport strike compounded difficulties in the fourth quarter, though the order book showed pleasing improvement as the year came to a close. A new management team will continue to implement savings while pursuing growth opportunities. Low demand and falling sales resulted in an operating loss. Management closed assembly operations within the Queenstown factory, resulting in a loss of jobs and retrenchment costs of R1,9 million. Working capital management improved and margins recovered somewhat following remedial action. The business is being repositioned to move the focus away from the lower end of the market where margins are under increasing pressure. Seating concentrates increasingly on injection-moulded backs and seats. The effect is to reduce the number of production processes. Trading conditions were challenging and revenue came under pressure. Even so, a marginal increase in trading profit was achieved, a pleasing result in a difficult year. Margins and expenses were well managed and cash generation remained strong. Market-share gains were achieved in the polypropylene and staples segments. A strong fourth quarter was the platform for modest, but pleasing growth in revenue and trading profit. Margins were well managed and cash flow was strong. The return on funds employed showed pleasing growth. The newly acquired unit was integrated into the Packaging and Catering component of our business with effect from March.